A full-time WWE star is on the road throughout a year, entertaining fans, away from their family most of the time. So, they miss a lot of family moments, and many cherished occasions, while putting on shows for us. Yet, while they do everything to provide for their family, it can all take a heavy toll on their relationships. While domestic abuse and illegal steroid use have come between couples, many times the couple have played their role in each other's lives, and hence move on in search of happiness. Some stars are lucky enough to have blissful relationships, while others have not been so lucky. 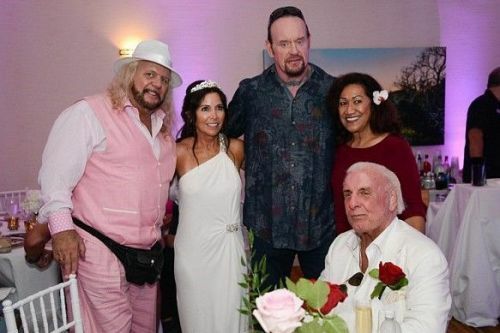 Here, we present ten current and former WWE superstars who married thrice or more. 80s and 90s kids believed with their heart and soul that The Undertaker was a dead man. Then, we grew up and the internet told us everything about Mark William Calaway, who played the character, and more importantly about pro wrestling. Basically, we lost an entire childhood of fantasy stories of him living in some graveyard. As it turned out, The Undertaker is not supernatural. And, like normal people, he has fallen in love and has got married too. Not just once, but three times. Undertaker's first marriage was with Jodi Lynn, who he married in 1989. The couple stayed together for ten years before divorcing. Then, Mr. Calaway married Sara in 2000. He even got a tattoo of her name on his neck, but their marriage only lasted seven years. Thereafter, the Deadman fell in love again and married WWE Diva Michelle McCool in 2010. The two have since stayed together.